It’s said that history is written by the winners. As far as Christianity’s story is concerned, the “winners” were not the earliest followers of Jesus but those who created the Christian religious establishment in succeeding centuries. In recent years, archaeological and textual discoveries have challenged some long-held ecclesiastical traditions. As a result, Bible scholars are unearthing significant aspects of the original faith of the first Christian church. 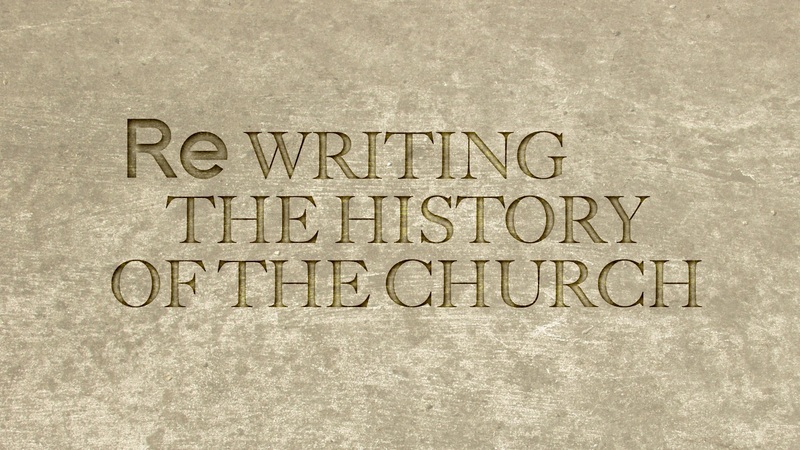 What we need now is to recognize that traditional church history deserves a rewrite. It is no secret that Jesus was Jewish and that His early followers were from the same background. A cursory reading of the four Gospels shows the Teacher and His disciples thoroughly embedded in first-century Jewish life. Their travels took them around Roman-dominated Palestine, of which Judea and Galilee were major regions. Here Jewish people flocked to hear Jesus teach—sometimes in synagogues, sometimes by the lakeside, sometimes in the countryside, sometimes in the temple. The cycle of Sabbaths and festivals observed by the Jews as part of the way of life and law commanded by the God of ancient Israel was central. This continued to be the case for the early New Testament church, for whom Peter and Paul, James and John were key figures. How strange it is, then, that traditional Christianity has for centuries avoided that heritage. But that is what happens when the winners are other people who tell a different story. We have been schooled in the idea that Christianity is law-free and that Christians are no longer under the yoke of the Jewish law. A notable actor in the move to free the developing religion from its Jewish background was the second-century heretic Marcion, who sought to remove anything related to the Old Testament—any perceived Jewishness—from Christianity. He devised a canon of Scripture for his followers consisting of only Luke’s Gospel and Paul’s epistles, becoming the first person on record to elevate Paul to a founding role in the religion that today claims more adherents than any other. Marcion notwithstanding, many in the second century who were considered Christian were deeply interested in the law and its application. This continued until almost a century after the church became part of the Roman state apparatus under Constantine. The now-dominant and increasingly powerful orthodox church began persecuting Jews, at least in part because of its failure to understand any relationship between Judaism and the apostolic church of the New Testament. It then solidified a self-identity that stood in opposition to Judaism. Not all who considered themselves Christian came on board, however. The continuing attraction of church attendees to the synagogue for a considerable time after the first century is exemplified by the fact that the late-fourth-century bishop of Antioch, John Chrysostom, preached eight sermons over a two-year period directed to church members attending the synagogue on Jewish Sabbaths and festivals—specifically Rosh Hashanah, Yom Kippur and Succoth. To the casual reader these festivals might seem to have no direct significance as they are only obliquely referenced in the New Testament, whereas Passover, the Festival of Unleavened Bread and Pentecost would be more readily understood. Yet they carry great symbolic meaning. This anomaly is yet to be discussed by scholars. Christendom and church history have also been built on the notion that Judaism existed as a single body in the land of Judea and Galilee. The discovery of the Dead Sea Scrolls helped scholars appreciate how diverse Judaism really was in the first centuries. Historian George Nickelsburg uses the term “variegated Judaism” to describe it. Rabbis in later times talked of as many as 80 sectarian groups in the land at the time of Jerusalem’s fall, and while that is generally considered hyperbole, it does indicate a high level of diversity among Jews of that day. More recently, some scholars have attempted to create a simple distinction between Jews who lived in the Diaspora and those who lived in Palestine. This, too, has proven to be a false construct. Jewish beliefs and actions varied wherever Jews were settled; there was no centralized organization of Judaism, even though the temple in Jerusalem and the Scriptures provided a common focus for all observant Jews. Martin Luther built on the false concept of a unified, ossified Judaism in his efforts to understand the writings of the apostle Paul. He imposed this misconception on his study of the New Testament, a mistake that effectively shaped later scholars’ views of church history—that is, until the latter years of the 20th century saw the rise of a new perspective on Paul based on a better understanding of the milieu in which he lived and worked. Rather than being the founder of Christianity as so many writers of the early to mid-20th century claimed, Paul has been rehabilitated as a loyal follower of Jesus. Even Jewish scholars have come to recognize Paul as an observant first-century Jew who would be greatly amazed at claims made about him by writers from the second century onward. The principal difficulty for church history in the 20th century arose from the work of Adolf von Harnack, who wrote what were considered seminal works on the subject in the early 1900s. Building on Martin Luther’s ideas and accepting uncritically the writings of the Church Fathers, von Harnack saw the orthodox church as having marched directly out of the pages of the New Testament. The Roman Catholic Church, he concluded, was the natural successor to the New Testament church, and any other element or group must be regarded as heretical. But von Harnack’s views have not withstood scrutiny. There was no obviously “orthodox” element to the church, just as there was no “orthodox” Judaism of those days. Those who claimed to be followers of Jesus could be identified simply as Jews or Jewish Christians at one end of the spectrum, all the way through to what are now classed as Gnostics at the other end. Although their diverse beliefs were largely built on a common foundation, that foundation was subject to significantly different interpretations. Some put great emphasis on the Scriptures themselves; others placed increasing emphasis on reinterpreting the Scriptures in light of various schools of Greek philosophy. As a result of this bias against first-century Judaism, various New Testament writers have been misunderstood and misrepresented. Let’s start with James, the brother of Jesus who was killed by the high priest in Jerusalem in the early 60s. Visit a theology library and you will find few books written about James. Compare that with those written about Paul, and a vast disparity emerges. Almost every aspect of the life of Paul has been dissected by writers, whereas James appears forlorn and neglected by comparison. Yet James was a prominent figure in Jerusalem from the time of Jesus’ death until his own assassination. In fact, according to fourth-century Catholic writer Jerome, the first-century Jewish historian Josephus had recorded a popular tradition that James’s killing precipitated the 70 C.E. destruction of Jerusalem—presumably as divine retribution. James was seen (even by those who did not claim to follow Christ) as a righteous man, killed for political reasons to enable someone of far less noble character to consolidate his power as high priest. If James held such prominence in the life of Jerusalem, and in the temple in particular, why is he not of greater importance today? Luke, in his account of the early church, shows that all the apostles including Peter and Paul showed respect and deference for the role of James in Jerusalem (Acts 12:17; 15:13; 21:18). Yet most writers until fairly recently attempted to characterize him as the leader of a law-observant Christian sect, an aberrant group that died out with him, while Paul championed a law-free Christianity in opposition to James. Current research on both James and Paul actually shows the two men to have been in remarkable harmony in their teachings. Long-held assumptions about the Gospel of John must now also be challenged. John’s Gospel has generally been considered Hellenistic, without any relationship to Jerusalem or Judea—even anti-Jewish. Scholars have commonly accepted that Gnostic writers initially embraced it and that it was consequently ignored by second-century orthodox Christians. As a result, historians and Bible scholars alike have placed the Gospel in a Hellenistic-Gnostic milieu. But textual studies and archaeology of the past century have turned these ideas on their heads. It is now understood that it was the Gnostics who viewed the book with suspicion, while followers of Jesus freely accepted it. What, then, of the religious writers of the second century? Our knowledge of that period has been limited to a few Church Fathers, most of whom did not speak from personal experience since their records date from subsequent centuries. These may at first appear to present a picture that supports von Harnack’s ideas, but on closer inspection they are found wanting. Ignatius of Antioch is generally listed as the first of these writers, having died about a decade into the second century, but his works exist in a shorter and a longer edition. The longer one contains all the material that supports von Harnack’s ideas of orthodoxy, but this material is now known to have been added to the original work in the late third century. A careful study of these additions places them almost two centuries after Ignatius wrote, at a time when an orthodox framework for the church was being sought. Careful consideration of Justin Martyr’s work, which dates from the middle of the second century, also leads to very different conclusions from the conventional wisdom of the past. Previous generations accepted his writings at face value as an insight into not only the church but also the Judaism of his day. However, thoughtful analysis shows that his writings were an attempt to create an identity for a group that really lacked any sense of identity. His Dialogue with Trypho is now considered by some scholars to have been a fiction rather than the account of a real event. He created an antagonist in Trypho, a Jew who knew little if anything of his religion or who was at least an inept spokesman, for the purpose of establishing a difference between the Jews of that day and the Christian sect of which Justin Martyr was a part. It’s another indication that Judaism in its various forms held a great attraction for would-be Christians of that era. Justin Martyr, like subsequent writers, felt compelled to create a sense of identity among Christians that was at odds with Judaism. The groups of people known to us today as Gnostics came into their own in the second and third centuries. They sought to create their own historical narrative based on Gnostic ideals, which were in large part a reexpression of Plato’s ideas. The Gnostics had a commonality with the already referenced heretic Marcion. Although they did not reject the Old Testament Scriptures outright as he did, they set up an antithesis between what they saw as the physical (and hence evil) nature of the Old Testament and the spiritual (and hence good) of the New. They recast the God of the Old Testament as an evil being. Although the Gnostics had essentially lost their legitimacy by the late third or fourth century, elements of their beliefs did influence the rising orthodoxy of that era and continue to influence orthodox church doctrine and belief today. The role of the fourth-century Roman emperor Constantine in the church’s development is another major factor in church history. His baptism was long naïvely accepted as a true conversion to Christianity. Little consideration was given to how he perceived his own role in the matter and whether his beliefs and behavior coalesced with biblical teaching. The available evidence now suggests that Constantine was fashioning the church for his personal benefit rather than trying to pattern it after the instruction of Jesus Christ as the church’s founder. A great source of information about Constantine and the developing church is Eusebius Pamphilus, a fourth-century bishop of Caesarea in Palestine, as it was then known. Eusebius is reckoned as the first church historian, and his Ecclesiastical History has been treated as “gospel truth” for centuries. The traditional view of Constantine as the first Christian emperor stems primarily from Eusebius’s works. The bishop’s motivations in recording his history were seldom considered until recent times, however. Today scholars recognize him as an acolyte of Constantine and his history as a biased attempt to justify the emperor’s role in the church. While Eusebius quotes from various earlier writers, his source material is carefully selected to create the impression that the dominant Christian sect (of which he was an adherent) developed naturally from the time of Jesus Christ to Constantine. It places Constantine squarely within a tradition that traces the orthodox church’s history, through him, back to Peter as the first bishop of Rome. Thus Eusebius’s writings need to be treated with a certain amount of caution. Typical of the questions being raised is whether Eusebius used available material to accomplish his own ends; if so, what did he ignore or omit from the story? Although he is still considered a useful church historian, his history is clearly framed by the politics of the Roman Empire. It was not until the 19th century that history—including church history—eventually broke free of the political framework that controlled historical writing. Today most scholars of early church history no longer view it as a settled path from Jesus Christ to Constantine. As we have already observed, a key factor in the growing skepticism surrounding the traditional account is an idea that is increasingly rejected by today’s scholars. Many generations of writers presumed that Judaism and Christianity parted ways starting on the day of Pentecost, a few weeks after Jesus’ death, and they viewed that as the beginning of church history. More careful readers of the New Testament, however, have noted the continuing use of the Jerusalem temple and synagogues by the apostles in preaching the gospel. According to some of these scholars the supposed break may have occurred in 70 C.E. with the fall of Jerusalem and the end of the role of bishop in that city. More recently others have moved the date of a presumed split even farther forward to the Jewish Bar Kochba revolt against Rome in 132–135, which resulted in Jews being banned from Jerusalem. But many historians of the period now consider even that date too early. As already noted, we see glimpses of the continuing relationship of some church-goers to Jewish communities a century or more after the reign of Constantine. The rule of Pope Damasus (366–384) represents the most likely benchmark for the ultimate dominance of the Catholic Church in a form that was subsequently overlaid onto the church’s earlier history. His papacy marked the beginning of the end for any remaining links between Christians and Judaism. The now-dominant orthodox church succeeded in establishing a Christian identity that had fully rejected its Jewish heritage, had reinterpreted the Scriptures in manners that would have been foreign to the apostles, and had absorbed countless pagan ideas while turning a blind eye to many biblical teachings. The resulting Christianity had no relationship with the founding principles of the church. In previous issues of Vision we have explored many of the issues raised in this article. We have examined issues from the first century that surround the circumstances of Jesus Christ and the early church. Moving into the second century, which has often been described as a lost century in terms of documented church history, we have examined some of the forces at work on the followers and teachings of Jesus Christ. We have explored the development of myths that became central to what is accepted as Christianity and the rejection of anything indicating the Jewish foundation of the New Testament church. We have also considered the development of alternate narratives in the second through fourth centuries, which built on a reinterpretation of Jesus Christ’s teachings—elements of which are established Christian dogma to this day—and created the Christian orthodoxy we see today. David L. Dungan, Constantine’s Bible: Politics and the Making of the New Testament (2007). Eusebius, Life of Constantine, translated by Averil Cameron and Stuart G. Hall (1999). W.H.C. Frend, The Rise of Christianity (1984). Amos Funkenstein, Perceptions of Jewish History (1993). Charles E. Hill, The Johannine Corpus in the Early Church (2004). Judith M. Lieu, Image and Reality: The Jews in the World of the Christians in the Second Century (1996). George W.E. Nickelsburg, Ancient Judaism and Christian Origins: Diversity, Continuity, and Transformation (2003). Elaine Pagels, The Gnostic Gospels (1979, 1989). David A. Reed, “How Semitic Was John? Rethinking the Hellenistic Background to John 1:1” in Anglican Theological Review (Fall 2003). Lawrence H. Schiffman, Reclaiming the Dead Sea Scrolls: The History of Judaism, the Background of Christianity, the Lost Library of Qumran (1994, 1995). Oskar Skarsaune, In the Shadow of the Temple: Jewish Influences on Early Christianity (2002). Carl B. Smith II, No Longer Jews: The Search for Gnostic Origins (2004). Tom Thatcher (editor), What We Have Heard From the Beginning: The Past, Present, and Future of Johannine Studies (2007). Peter J. Tomson, Paul and the Jewish Law: Halakha in the Letters of the Apostle to the Gentiles (1990).